Waterford FC manager, Alan Reynolds. Photo: Noel Browne. 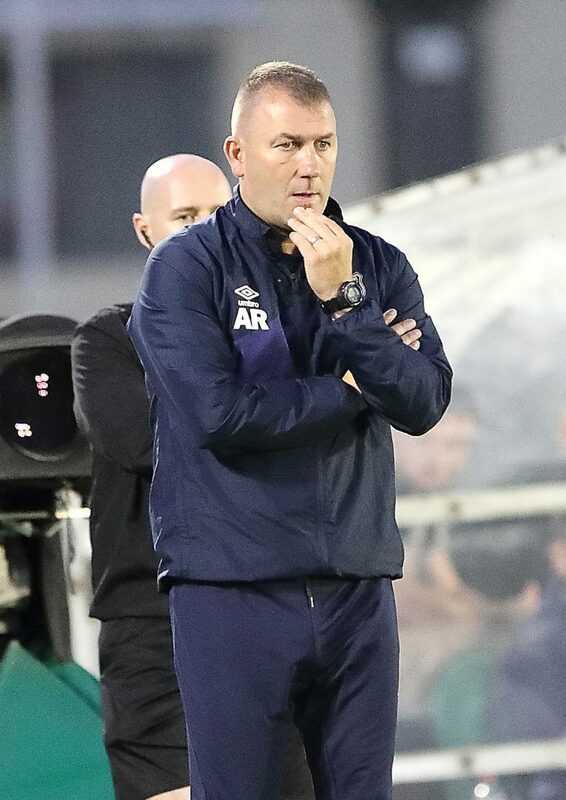 Waterford FC still sit third in the SSE Airtricity Premier Division despite losing for the third time to Cork City in the Munster Derby played in front of a massive 3,287 crowd at the RSC on Friday night last and manager Alan Reynolds is hoping that his side can continue to improve in their remaining games. Speaking after the game, the Blues boss said, “I thought it was a tight game. We had a few chances in the first-half that we could have taken, but they have some good players and I thought that both Garry Buckley and Graham Cummins were always a threat for them. “I thought in the second-half that we didn’t start well. I thought that they were good for 20 minutes. We did have a go at the end, that’s what we’ll do, but I thought that they defended really well and we just couldn’t break them down. “I think that straight after scoring, we’ve got to be better at dealing with the opposition than we were tonight. We’re disappointed at that end of it because when you get 1-0 up that you see it through for a bit, but it’s a sloppy goal to concede from our end. We’ll need to work at that going forward. “I thought that there were spells in the first-half when we were really good and we could have scored a few. Izzy and Gavan had a couple of good chances. You don’t get too many against the likes of Cork and Dundalk. When you do you need to take them. “We’re learning and we’re improving all the time. I spoke to the players and media about this earlier that we are going to have our ups and downs. People were patting us on the back and everyone on the back but now they are queuing up to stick the knife in with certain sections. “There is a great group of players there and they are disappointed. They will keep working hard because they are proud to play for this city and county. We just need to keep going. I think that when you look through it and look at players like Duffus, Barnett and Feely. They are young players and confidence is a little down. “It’s part of their career and they’ll have their moments. We’ve got to be positive and keep going. We’re disappointed but we were beaten by the odd goal to the champions. There’s not much in it and we’re not too far away. We need to improve in certain areas and we’ll try and do that as we go on but we’re not too far away,” concluded the Blues boss.